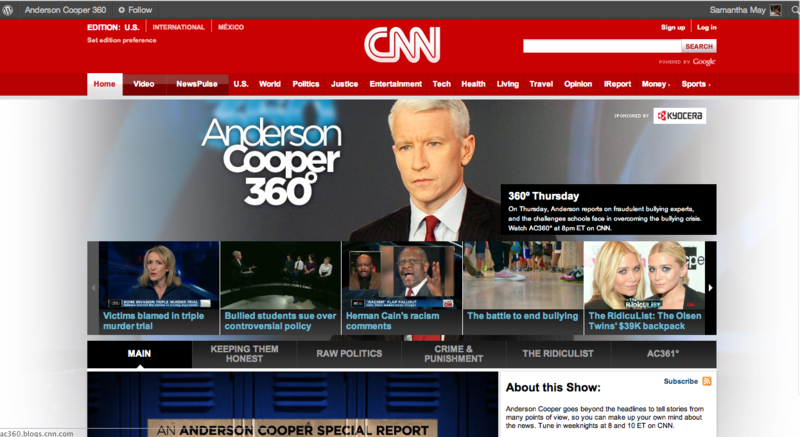 Anderson cooper’s 360 blog is about CNN’s anchor Anderson Cooper’s take on news: It is Anderson’s blog, where he posts stories on different topics classified under the web page sections. Design wise we believe there is so much going on that it could be confusing, the rolling banner with featured stories allocated right on top of the blog’s main sections and over the blog’s image is confusing, since it appears to be part of the blog’s sections but is not. Target audience we believe is 18+, since there are news but also feature stories on celebrities and entertainment, as well as opinion pieces. The Website is also obviously tailored for news fans specific to anderson cooper, because the draw to the blog is to see what Anderson Cooper is thinking about and reporting on. Business goal: to reunite fans of Cooper’s show. 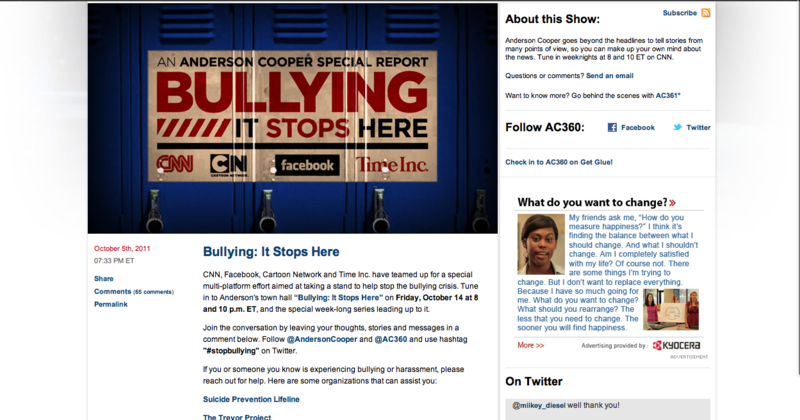 Fan’s of Anderson cooper can find even more media content curated by him which focuses on much more than current events televised on CNN. Readers can find anything from media related to politics to Entertainment media and the occasional internet joke. Underneath every video there are sharing links to Facebook, Twitter, Digg, Del.icio.us, Reddit, Myspace, and Stumbleupon. Also a Twitter feed and a Facebook link to a “LIKE” page. And a RSS subscribe button. Navigation, per se, is easy since again the site is pretty well-organized according to sections, which if you are familiar with Cooper’s style of reporting and his show style is quite evident which section refers to what topic. If one isn’t familiar with him, then the title names of the sections, even though give a hint on the topic they treat, aren’t particularly describing for newcomers.There’s a lot of blank spaces where a video or maybe image was supposed to be featured. Videos are too wide, and pics too big and make the page look overcrowded with stuff, including the sponsor ads and the twitter feeds.